taxi service and even free shoe shines. 10,300 are on strike at the plant. 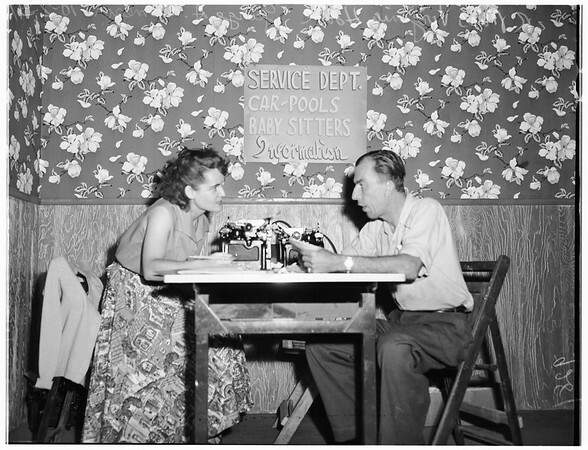 In picture, striker Walter Applebee is cutting hair of picket P. J. Simpson, while in next chair Beatrice Engle is giving Mrs. Mildred Chassie a 'hair-do'. Strikers doing picket line duty even get free shoe shines at strike headquarters, Lakewood Blvd. and Spring Street. Here Bob Beldin shines Bill Baker's shoes and gets credit for picket line duty. Strikers who do no picketing are not eligible for relief of any kind from strike committee, explained Chairman Leonard Bushey".